Somewhere along the way, my three worlds—personal, professional and organizational—became saturated with activity. More responsibility, more worthwhile tasks and more can’t-miss family moments mean that decisions about what to do and when to do it are more important than ever. A productive life doesn’t happen by accident. You don’t stumble upon great personal choices, plans, priorities and goals. One of the most important lessons about personal productivity is that you have to spend intentional time planning your daily and weekly schedule. I have two kinds of problems, the urgent and the important. The urgent are not important, and the important are never urgent. That statement is at the heart of the Eisenhower Matrix, a method for making consistently good decisions about time and your agenda. I set aside my first hour on Monday morning to plan and prioritize the coming week. It’s my planned weekly time to make decisions about important, unimportant, urgent and not urgent tasks. Here’s how it works. 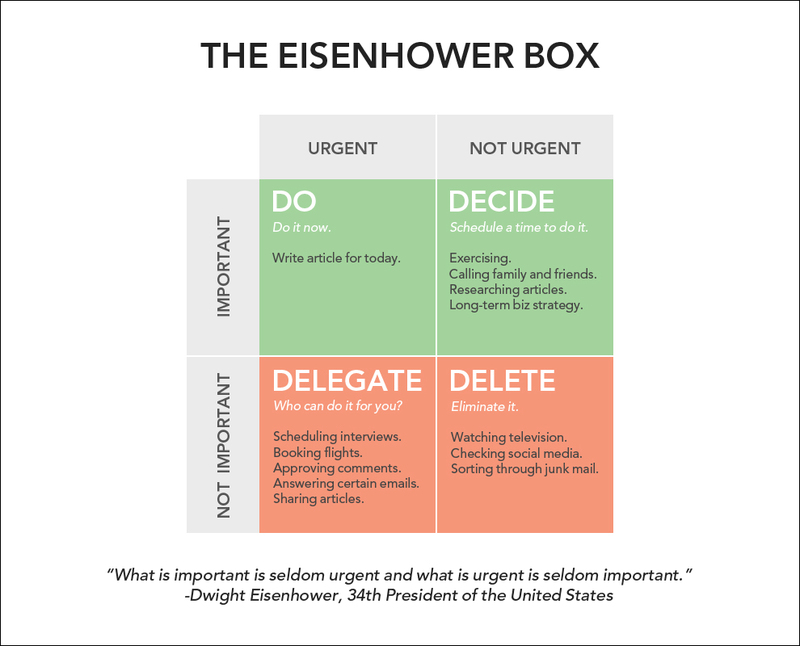 In what is now called the Eisenhower Decision Principle, tasks are evaluated and sorted using important-unimportant and urgent-not urgent criteria. Those tasks are then placed in one of four quadrants in the Eisenhower Box or Matrix. Know what to DO now. What IMPORTANT/URGENT things should be done immediately and personally? This includes time-sensitive items that have a deadline or problems and crises needing immediate attention. These are things that require your personal attention or presence and can’t be done by anyone else. Know what to SCHEDULE later. What IMPORTANT/NOT URGENT things should be scheduled? 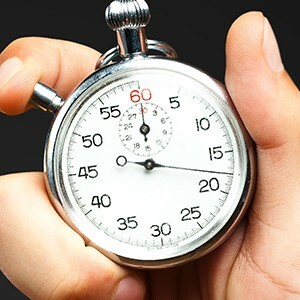 This includes important tasks that may not have a target date or time limit. But since these things are still very important, you need to intentionally plug them in to your personal schedule. You might need to schedule things like strategic planning, relationships, goal setting or other significant tasks you can never seem to make time for. Know what to DELEGATE to someone else. What UNIMPORTANT/URGENT things should be delegated? This includes routine items that can be done by someone else. These things don’t require your presence and that makes them a prime candidate for delegation. Ask yourself the question: Who can do it for me? You might need to delegate tasks like routine administration, scheduling, meetings and activities. If it doesn’t require your personal touch, then delegate it. Know what to DELETE. What UNIMPORTANT/NOT URGENT things should be dropped? This includes everything we can live without in our personal, professional and organizational worlds. These are things that we can drop or eliminate from our routine to make room for more productive tasks. Examples include time wasters, low priority items, entertainment or anything else we can do without. One of the most important lessons about personal productivity is that you have to spend intentional time planning your daily and weekly schedule. Know what to do now, what to schedule later, what to delegate to someone else and what to delete. Make better decisions with the Eisenhower Matrix. “Time Management,” Accessed April 23, 2015, http://en.wikipedia.org/wiki/Time_management. 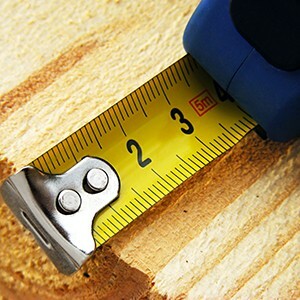 We have long measured outward signs of church health. They tell the story of needs met, people reached and lives changed. But do traditional measures of health tell the most important parts of that story? Too many church leaders have bought into the myth that to clarify the win means establishing attendance goals and raising a lot of money. These can certainly be indicators about the health of your organization, but strong numbers in these areas do not necessarily mean you are winning. Consider how you know your church is winning. Healthy churches are known for their worship and their witness. They are purposeful places of discipleship, ministry, evangelism and missions. They are Great Commission and Great Commandment places of authentic Christian fellowship and community. 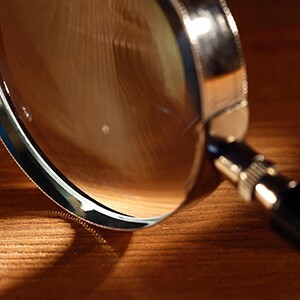 The key is knowing with certainty whether or not those words accurately describe your church. You may intuitively know the answer based on experience and anecdotal evidence, but dig deeper to build an evenhanded picture of church health. Ask the right questions. Analyzing the data you’ve gathered may take some time and effort. It may also require a brainstorming session of your ministry staff team and other church leaders. Pray over the results of your research. Examine the numerical data closely and stay true to what it tells you about your current situation. • Consider the sample questions below. Research who you are and where you’ve been. Ask the right questions about the information you gather. And consider past and present definitions of success. That’s the way to take an unbiased, evenhanded snapshot of church health. What does the raw data tell you about your church? Is your church growing, plateaued or declining? Are you reaching unchurched people in your community? How many church members did it take to baptize one person? Does this number seem unreasonably high? Are you reproducing disciple-making disciples? Does the church show signs of spiritual health? What are age division attendance patterns in small groups? What growth opportunities exist in those patterns? Is morning worship attendance advancing or declining? Andy Stanley, Reggie Joiner and Lane Jones, 7 Practices of Effective Ministry (Colorado Springs: Multnomah Books, 2004), 71. There have been too many seasons in my life when I settled for the good at the expense of the great. It’s happened when I was too comfortable with life, my job and my organization, and the result has been something far less than what I’m capable of. In those moments, a lack of self-discipline and the absence of a personal growth plan created conditions where ruts and bad habits flourished. Several years ago, I struggled with a prolonged period of complacency. Soon after the completion of a major project at work, and despite my best efforts to avoid it, I rested on the laurels of past success. Partly the result of burnout and partly due to a letdown from the “high” of a great accomplishment, good-enough work took the place of really great work. It didn’t happen suddenly. Instead, a series of small compromises gave way to a habit of mediocrity. The difference between good and great was so slight that many didn’t even notice the change. For some friends and team members, good-enough living has always been standard operating procedure. These folks were satisfied with less effort and vision, and a lesser result. After two years of vapid work, it dawned on me that I couldn’t go on this way. When the great is within reach and possible, the good just isn’t good enough. Recognize that habits can progress in both good and bad directions. When you make future-focused choices, you build growth habits that lead to breakthrough results. When you make comfortable choices, you tend to reinforce habits that lead to apathy, complacency and mediocrity. Greatness is not a function of circumstance. Greatness is largely a matter of conscious choice, and discipline. Spiritually – Glorify God in everything you do. Financially – Save for your future and eschew materialism. Intellectually – Learn something new every day. Physically – Exercise your mind and body regularly. Personally – Set personal goals daily and weekly. Professionally – Grow in your professional skills and knowledge. Organizationally – Give your best work every day. Don’t settle for the good at the expense of the great. 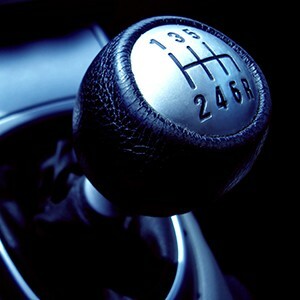 Make the decision to shift gears from good to great in every area of your life.